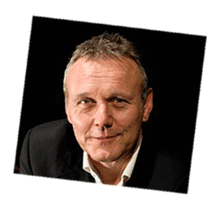 Anthony Stewart Head was born on February 20, 1954 in Camden Town, north London, England. Anthony is an English actor and musician. Having already had a successful career, with regular TV appearances and stage roles, including leads at the Royal National Theatre, he became “a household face” in the UK following his role in the, now classic, commercials for Nescafé Gold Blend (Taster’s Choice in the U.S.). He is internationally known for his roles as Rupert Giles in Buffy the Vampire Slayer and Uther Pendragon in Merlin, and for his role as Geoffrey Howe in the Oscar award winning film, The Iron Lady. He has also been attached to a number of other successful TV series: Little Britain, Dr. Who and Manchild. He was most recently seen in Stephen Poliakoff’s, Dancing on the Edge, Percy Jackson: Sea of Monsters directed by Thor Freudenthal, You, Me and Them on UK Gold and Dominion for Syfy. In theatre, his credits include Peter Shaffer’s Yonadab at the National, Rupert Cadell in Rope at Chichester and Wyndhams and, more recently, Six Degrees of Separation at the Old Vic. Anthony is the youngest son of parents, Seafield Head (a documentary filmmaker) and Helen Shingler (an actress). He is the younger brother of Murray Head, who originated the role of Judas in ‘Jesus Christ Superstar’. Anthony himself has appeared in a number of musicals, such as Godspell, Chess and The Rocky Horror Show, and has recorded a variety of music over the years. Anthony’s long term partner is well known animal behaviour counsellor, Sarah Fisher, whom he met at the National, when he was performing in Danton’s Death. They are parents to actresses Emily and Daisy Head.